Officially, March is Irish-American Heritage Month, a time to recognize the contributions of the Irish people to the United States. Of course, this month also brings St. Patrick's Day (March 17); and unofficially, it's the month of everything green. 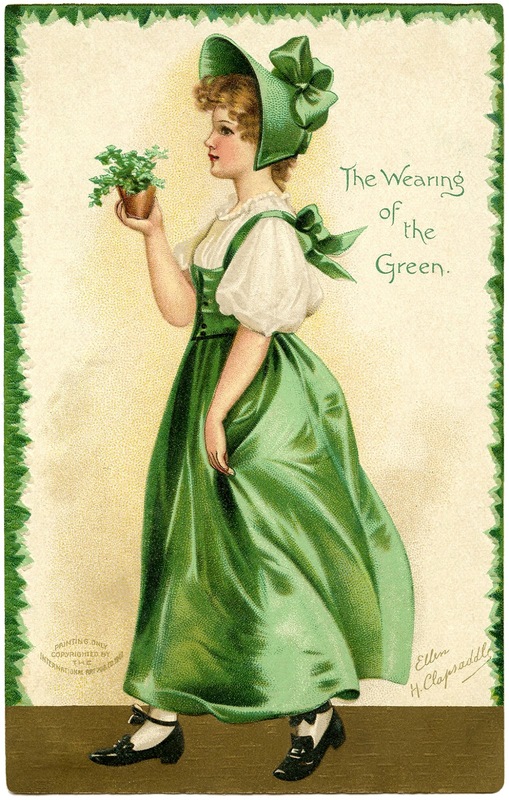 Like Mardi Gras or "Fat Tuesday," St. Patrick's Day is often a day filled with over-indulgence -- lots of parties, plenty of alcohol, and a ton of less-than-healthy food. But what if you're trying to eat right? We have a delicious, satisfying way to celebrate the Green Month without breaking the carb or calorie bank: Skinny Shrimp Fettuccine Alfredo. 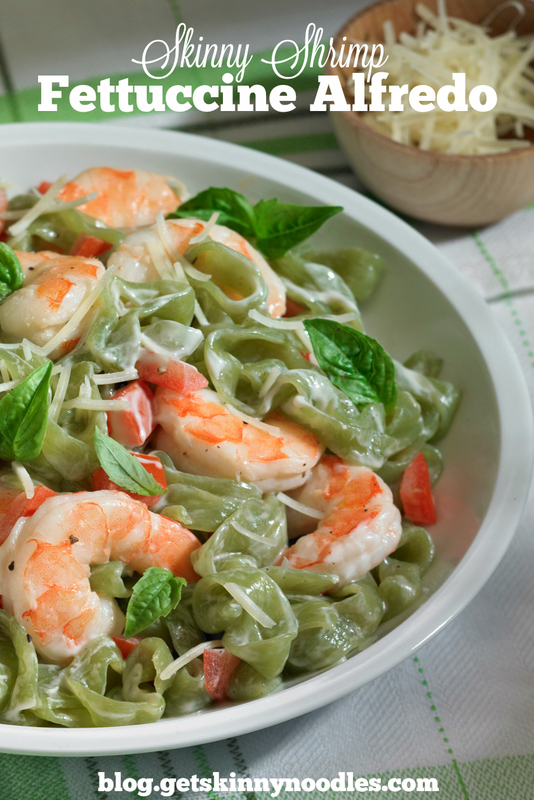 Our light version of this Italian classic has less than 250 calories and only 9 grams of carbs per serving. 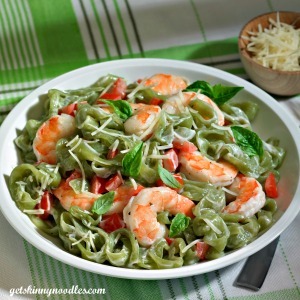 The secret is colorful, low carb, low calorie Skinny Noodles Spinach Fettuccine. With 4 grams of filling fiber and 45 percent of the RDA for iron per serving (1/2 package), Skinny Noodles Spinach Fettuccine packs a powerful, Popeye punch! The noodles have a mild flavor that makes them a perfect companion for the creamy, delectable sauce. And because the dish is made with shrimp, it's also an easy meatless meal especially during Lent. Not a fan of shrimp? Substitute chicken or mushrooms instead. Finding ways to take good care of yourself shouldn't be like finding a pot of gold at the end of the rainbow. It's not about luck. It's about finding balance: Eating right and moving as much as possible most days. "You'll never plow a field by turning it over in the mind." Drain and rinse Skinny Noodles thoroughly. Parboil Skinny Noodles for 2-3 minutes; drain and set aside. Combine shrimp, onions, and garlic in a small bowl. Heat a large skillet over medium-high heat. Add olive oil; swirl to coat. Add shrimp mixture, and sauté for 4 minutes or until shrimp are done. Remove from pan; keep warm. Reduce heat to medium. Add Parmesan, half-and-half, cream cheese, and pepper to pan. Cook 2 minutes or until cheeses melt. Combine pasta, cheese mixture, and shrimp mixture. Sprinkle with parsley, if desired. Shirataki noodles and shirataki rice like Skinny Noodles are made from a root native to Asia called konnyaku (konjac). This root (sometimes mistakenly called a yam, although it is not a member of the yam or sweet potato family) is naturally low in calories and carbs, and a good source of healthy fiber.